They are from differing parts of the globe and all have something in common; they have been brought here by virtue of a quest, to drive and ultimately win the Indianapolis 500. One of their first steps to that conquest is to become the Indianapolis 500 Rookie-of-the-Year. That is by no means a simple task. The honor has been bestowed on the likes of Mario Andretti, Rick Mears, Jim Clark, Jackie Stewart, Parnelli Jones and Tony Stewart to name just a few. The Indy rookie drivers of 2014, all have something in common, they will be following in the footsteps of the first Indianapolis 500 Rookie-of-the Year, Art Cross. 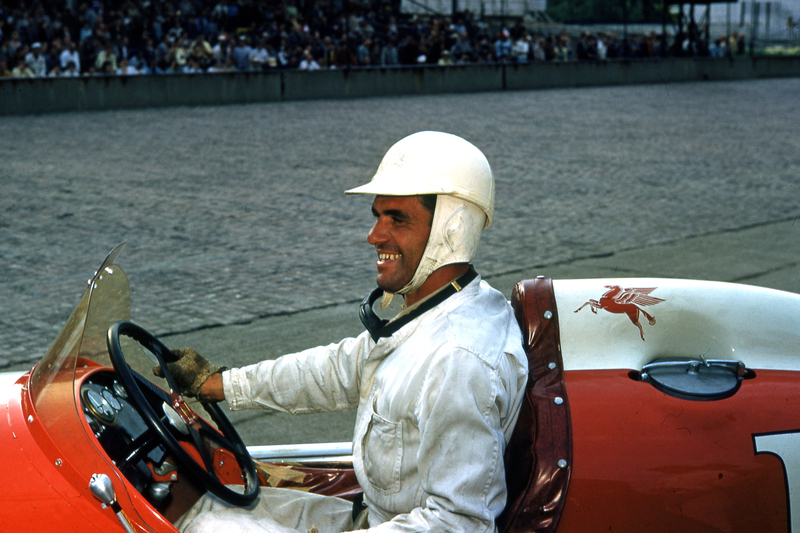 To understand the type of driver and man Art Cross was, you only have to look to his record during the some of the most brutal racing conditions known in American history. 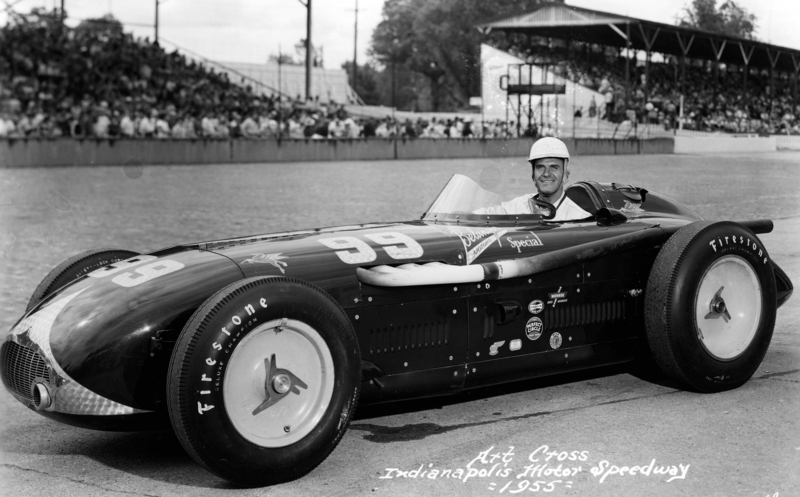 Art Cross ran in four Indianapolis 500s. Then he walked away from racing for good. The Art Cross story really begins with his youth in Jersey City, New Jersey. As he grew to manhood, he started racing in the ultra-competitive East Coast midget racing contests. He then entered the Army Tank Corps during World War II, eventually being wounded in the “Battle of the Bulge” and subsequently being awarded the Purple Heart. Following the end of the war, Cross returned to the States and began midget racing again. Soon he learned that there was a burgeoning racing circuit growing in the Midwest. A series that offered more promise and the potential of finding his way to driving in the “Greatest Spectacle in Racing,” the Indianapolis 500. 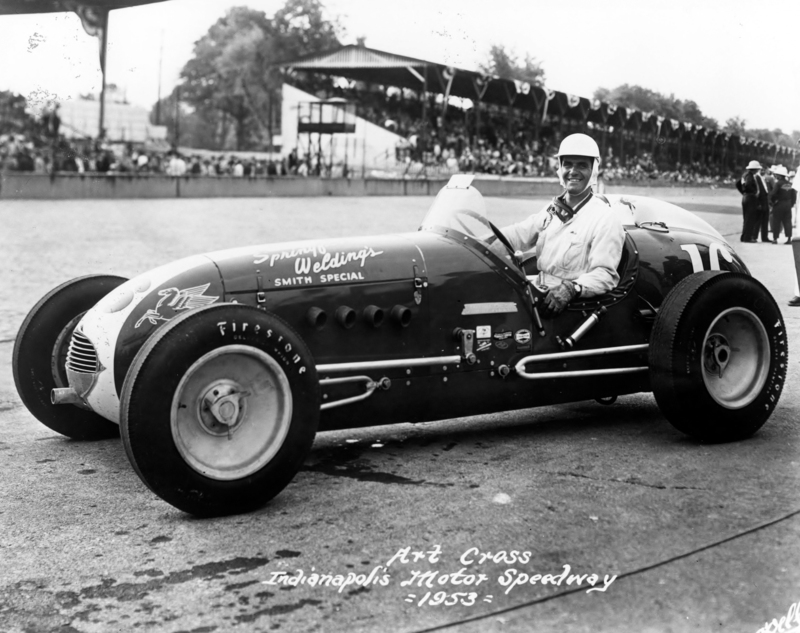 Art Cross came to Indianapolis an unproved rookie in 1952. He was able to secure a ride in the No. 33 Bowes Seal Fast Special, a Kurtis-Kraft 4000/Offy. Starting 20th he battled his way up to the leaders and stayed in contention for most of the day finishing fifth. So impressive was Art Cross’ performance in his first Indy 500 that he was named “Indianapolis 500 Rookie-of-the–Year.” The first time the award was ever bestowed. In addition to that accolade he also earned membership into the prestigious “Champion Spark Plug 100 Mile an Hour Club” on his very first try. But the real measure of the man came in the 1953 race. The 37th Running of the Indianapolis 500 was a scorcher and not just because of the speeds that the 33 racers were generating on the track. Ambient air temperatures near 100 degrees, along with track temperatures of 130 degrees coupled with nitro-methane exhaust fumes, created a never before realized hazard at Indy, and in the end it was the only Indy 500 on record where a driver, Carl Scarborough, died during the race because of heat prostration. Of the starting 33 drivers in the 1953 Indianapolis 500, a total of 16 called for relief drivers generating a staggering 85 pit stops during the course of the race. At one point, even the relief drivers were begging to be relieved. 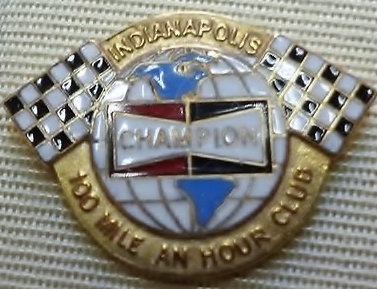 Winning what would later become known at the “The Hottest 500” was legendary Indy “Iron Man” and eventual two-time winner of the Indianapolis 500, Bill “Vuky” Vukovich. Finishing right behind Vuky was LaPorte’s own, Art Cross. Both men drove the entire 500 miles distance themselves. 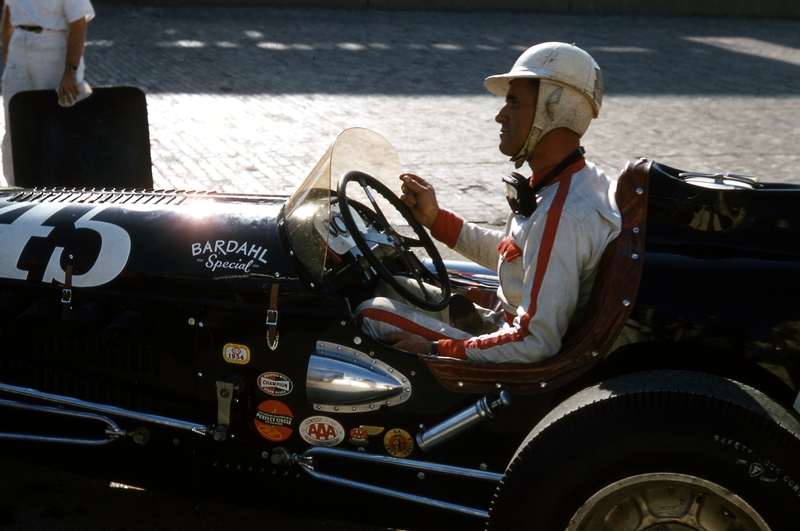 His second Indy 500 revealed even more of what Art Cross was made of. Driving the No. 16 Springfield Welding Special, a Kurtis-Kraft 4000/Offy, supported by chief mechanic Ralph Ruttman (father of 1952 winner Troy Ruttman) for the 1953 Indy 500, he qualified better than he had in 1952, starting on the outside of the fourth row and pushing his way all the way into second place. He held on through the unbearable heat, knowing that his car didn’t have the power to overtake the race leader Vukovich, but hoping that Vuky’s car might fail. Cross shadowed him for all 200 laps, finishing with an average race speed over 126 mph. Art’s Herculean performance netted him $27,296 in race winnings and with his new found wealth he purchased a 40 acre farm near LaPorte. 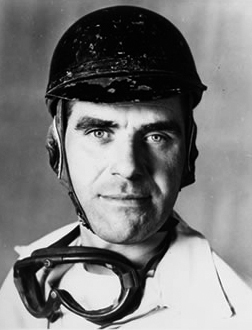 While at Indianapolis in 1953, during the Month of May, Art Cross gave an interview to Floyd Clymer a noted racing journalist. In that interview, Cross said he had three goals in life; 1) Win Indianapolis. 2) Own a farm and 3) Raise corn and children. He may not have won the Indianapolis 500, but the things he did accomplish are some of the most noble a man can strive for. In addition to his many successes as a businessman and father, he was inducted to the National Midget Auto Racing Hall of Fame. The Indianapolis 500 Rookies of the Class of 2014, would do well to match many of the achievements of Art Cross.